2013 Market Share of Travel Agency (in terms of International Trip), Japan - How much is it in Tokyo? In 2013, travel agencies in Japan handled the total amount 2.27 trillion yen of overseas trips, according to Nikkei press. 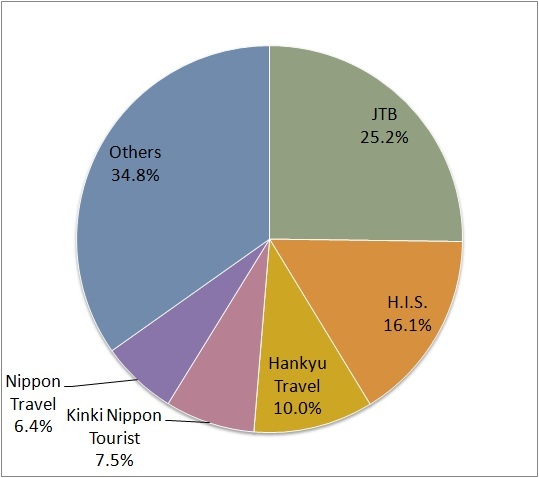 JTB (formerly known as Japan Tourist Bureau) had the biggest market share (25.2%). A new comer H.I.S., founded in 1980, chases JTB. Traditional agencies which have more than 50 year history, took from 3rd place to 5th place (Hankyu, KNT, and Nippon travel).